The Pig is famous. Reviews crop up in national newspapers and 2012 saw it crowned as Sustainable Restaurant of the Year at the National Restaurant Awards. 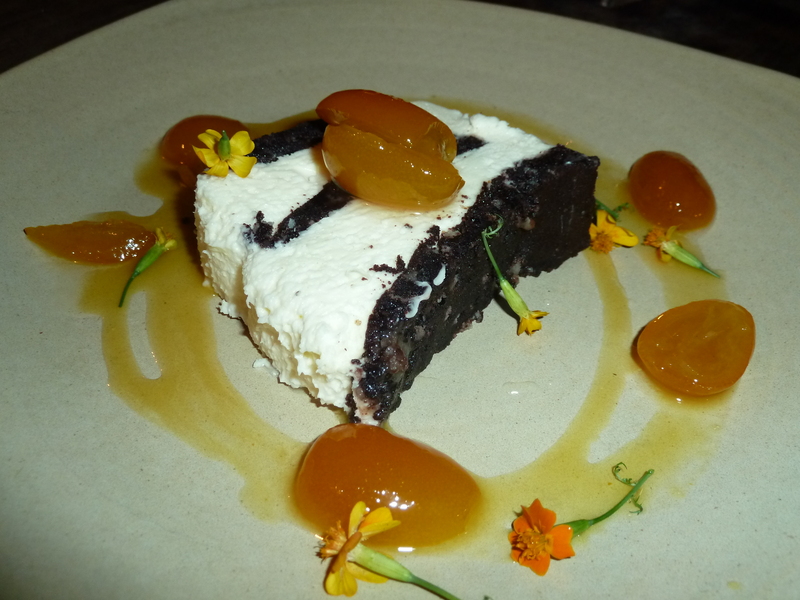 It adheres to a 25-mile menu – everything on the menu is sourced from within 25 miles, much of the vegetable produce is grown in its own garden, and all its eggs come from its own birds. Combine this top-quality, sustainable food with a location in the middle of the New Forest, and ensure you have a beautiful manor-style house with hotel rooms, and you have a recipe for success. The Pig is seriously popular. However, I personally think that part of the attraction is in the name. It’s short, catchy, and inextricably linked to food – even if you don’t eat pigs, you can always eat like a pig. My father and I are dining in honour of his 58th birthday and we’re looking forward to stuffing ourselves to fit in with the sign. 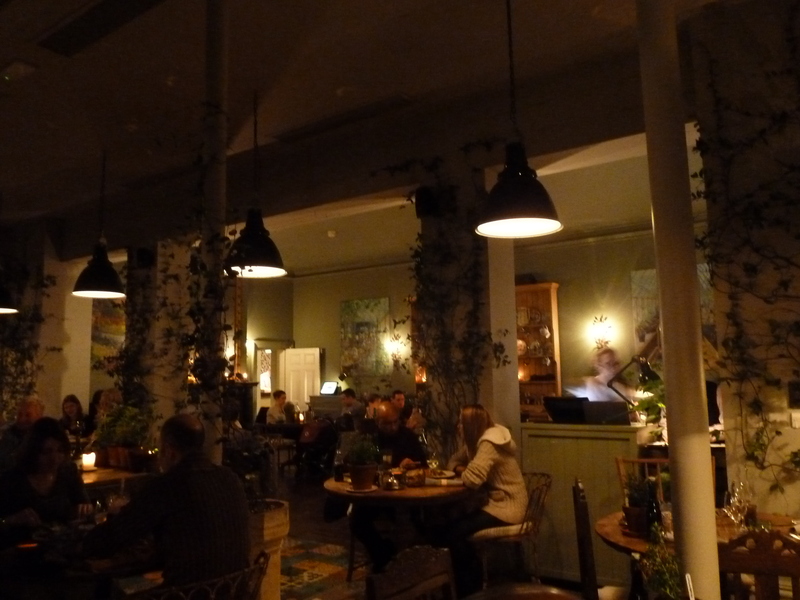 We settle down into an airy dining room, dimly lit and with plants climbing the walls and pillars. The place is packed, but there’s no rushing about and the acoustics are good: no conversations intrude, and our conversation feels private. We are seated at a table by a friendly lady (“How are you today?”) and left for a very short while to peruse the menu. A waiter pops up. He’s also very friendly. “How are you?” he asks. We politely reply. He asks us whether we want to order some wine. Dad wants a beer first. But the waiter struggles to remember the beers on offer and his accent unfortunately turns the beer list into gobbledygook. 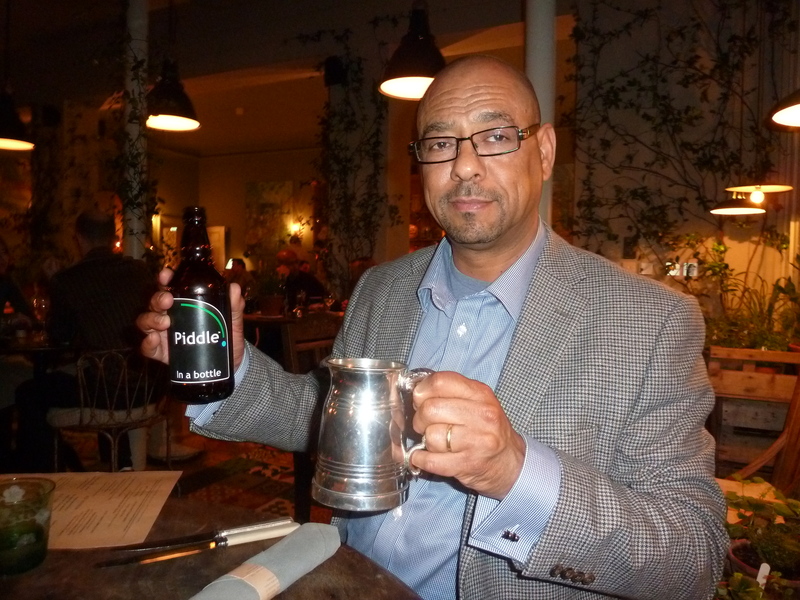 Dad ends up selecting one at random – “The second one you said.” He ends up with Piddle. Another waiter comes along. Again we go through “how are you?” and “would you like some wine?” At this point, we’re getting a little fed up. Service should be polite and warm, but should not involve robots. However, this approach to service wouldn’t have been so terrible, except for the fact that we were served by no less than 6 waiters throughout the course of the meal. It was a bit of headache and annoyingly, we often had quite a wait before anyone spotted and attended to us. Furthermore, when wine is priced at £12 a glass or more, the repetitive questions about it seem less than innocent. To top this off, in a bizarre incident, one waitress took my dirtied knife off my starter plate and put it back on the table instead of replacing it. That’s not service, and it’s also a little bit gross. However, this is The Pig, and we were determined to enjoy our meal. We ordered three starters between us. 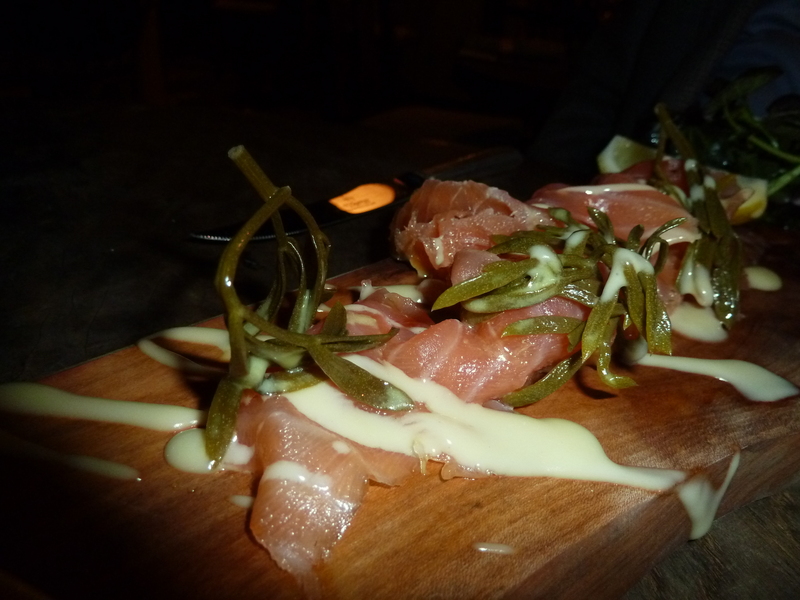 Dad tucked into some Smoked Salmon with Watercress and Cider Dressing (£8) that was absolutely phenomenal. I attacked the Home-Made Pork and Onion Pie (£7) – “attacked” because it was incredibly hard to cut. Fortunately, it wasn’t hard to chew and it really took me back to my childhood of when I’d eat an occasional pork pie from a deli – although The Pig’s was definitely superior and nicely complimented by mustard and a pickled duck egg. 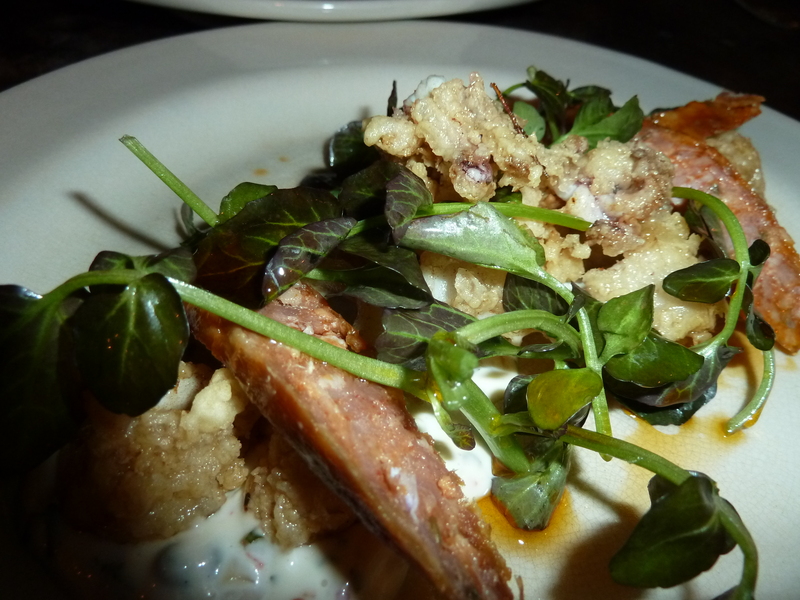 We shared the Fried Baby Squid and Bartlett’s Hampshire Chorizo (£7.50). The flavours went well together, but the chorizo was a tad too mild for my taste, and the tartare sauce a tad too creamy. 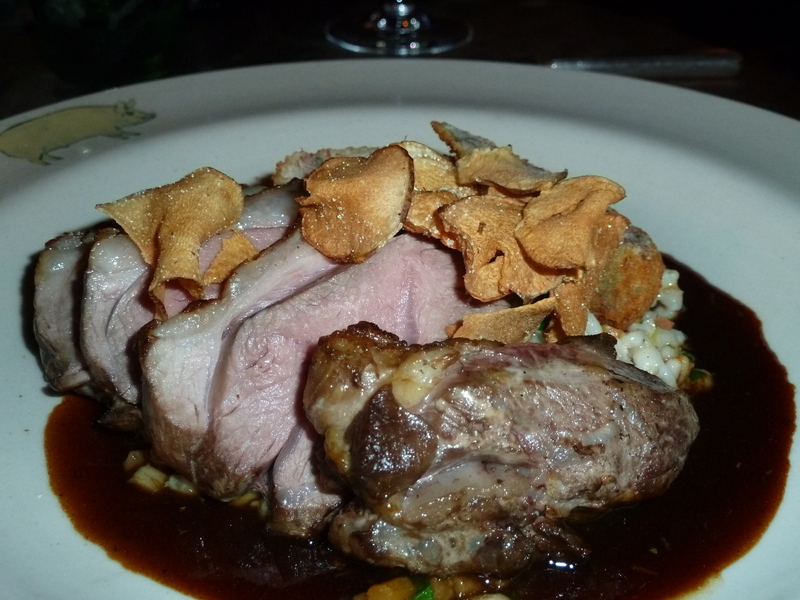 For mains, we took Roast Rump of Holcombe Water Farm Lamb (£18), which came with pearl barley and rosemary jus. The lamb was tender, tasty, and pleasingly pink. The pearl barley added an earthy flavour dimension, which complimented the lamb very well. On the advice of a friendly waitress (I believe genuinely friendly in this case! 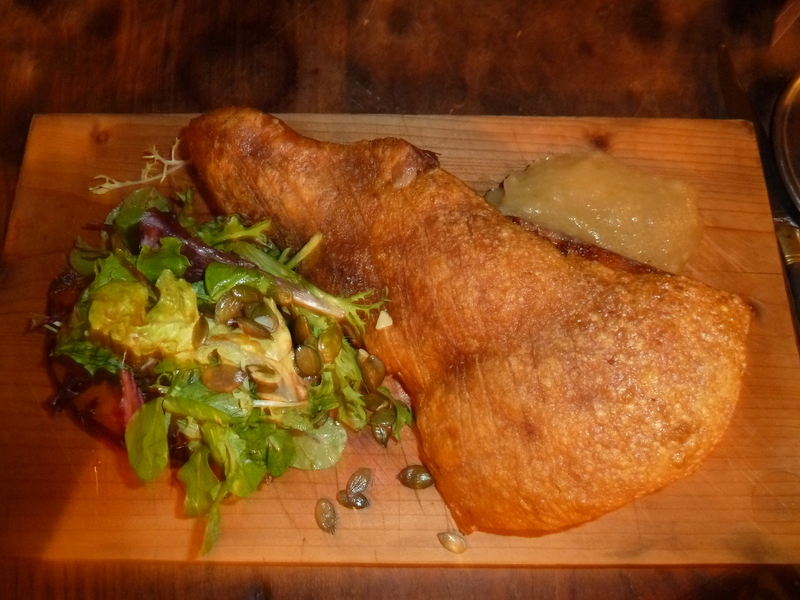 ), I ordered Roasted Bath Chap (£15.50). 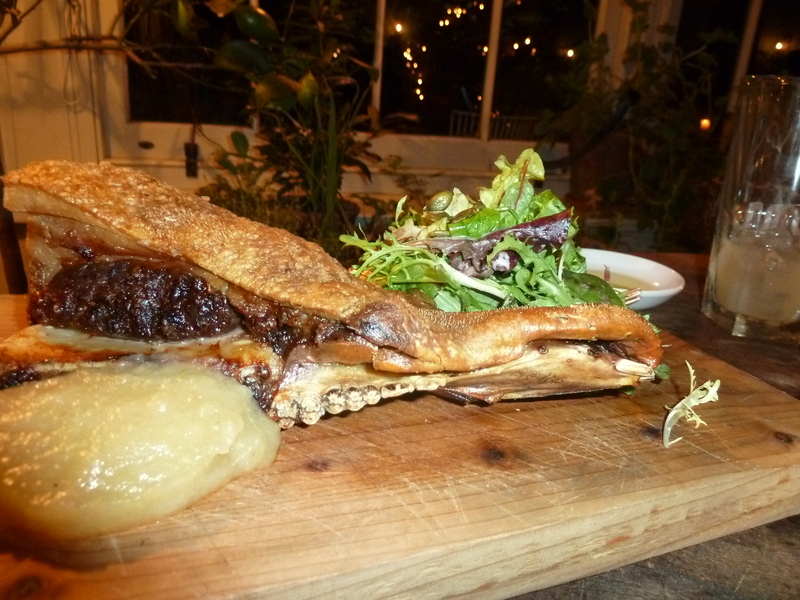 This is pig cheek served on the bone, and so if you order this, do expect a third of a pig’s skull to end up in front of you. Actually, it almost didn’t end up in front of me, because a waiter assumed that a lady would not be eating a pig’s head with teeth (he inspired my piece on food and sexism). The waitress had described the meat that surrounds the pig cheek as very fatty but very delicious, like belly pork. However, I wasn’t prepared for just how fatty it would be. Pig head meat makes belly pork look lean. After two mouthfuls I was struggling as the richness of the fat weighed heavy in my stomach. I located and extracted the pork cheek. It was very tasty. But it was very small. 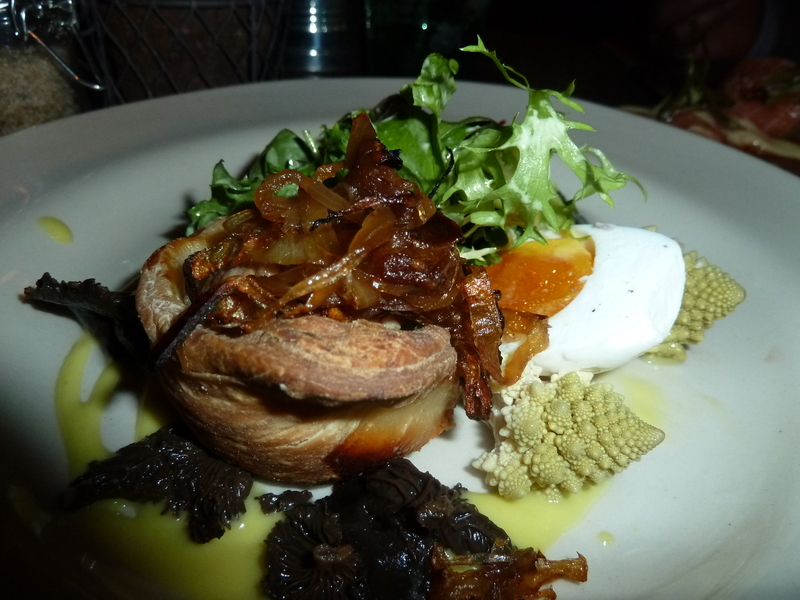 Credit should be given where it’s due – the crackling was cooked to crispy perfection. My satisfaction was reduced by the accompanying squash, which was bitter and unseasoned, and completely inedible. To accompany our meal we ordered a side of Thyme Roasted Rainbow Carrots (£3.50). Do not make the mistake of assuming rainbow carrots will be colourful version of normal carrots. They look like very ugly parsnips, and they don’t taste like carrots. In fact, they don’t taste like very much at all. Avoid. 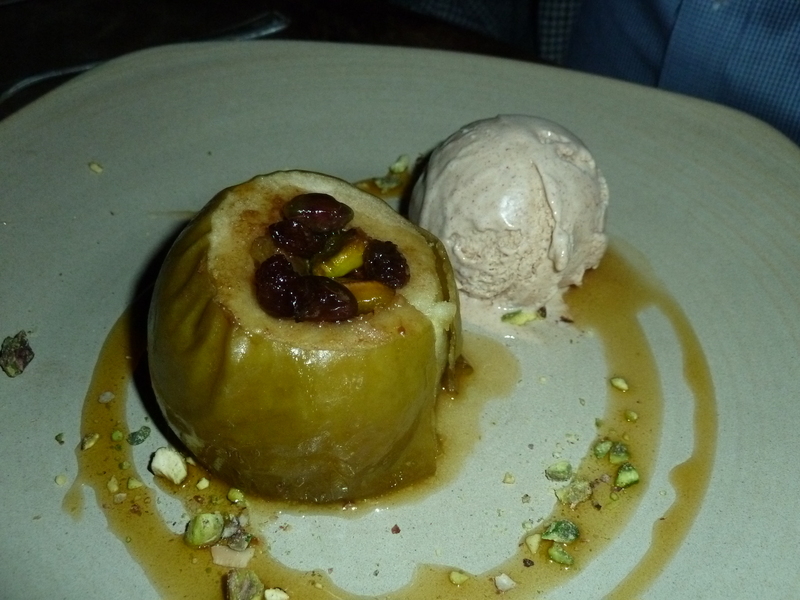 Dad ordered Stuffed and Baked Apple (£7) which was really delicious and I’ve been craving cinnamon ice-cream ever since. 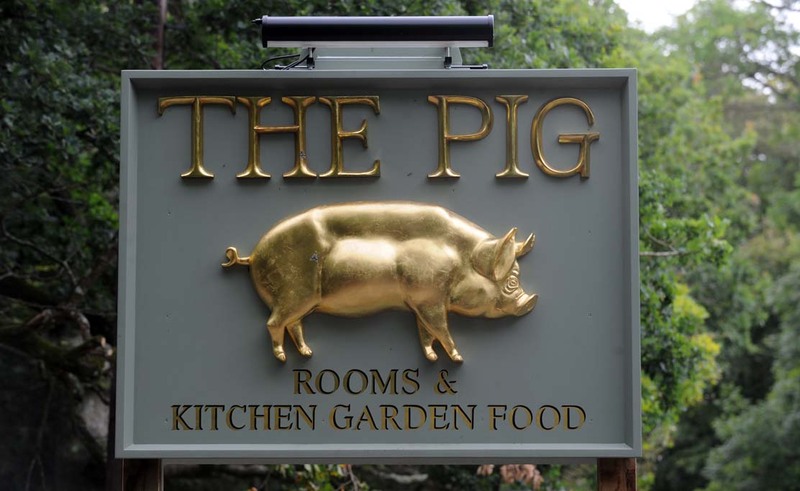 The food at The Pig was quite enjoyable, but for the prices, I would have expected exceptional dishes, and more sophisticated – or just plain logical – service. Whilst I truly admire the sustainability ethos, changing the menu every day must surely reduce its quality – how can the chef learn to cook each dish to perfection under those circumstances? The acid test is – would we go back? The answer is sadly no. My dad was a disappointed boy on his birthday, and £127 poorer – he paid for us both, as only dads do. Next E Pellicci Review / A damn good breakfast!